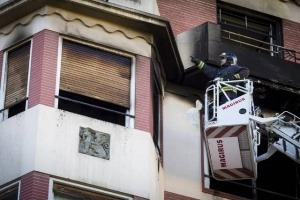 A 12 year old girl died last weekend in a fire in Zaragoza. The girl had gone to the Aragonese capital to spend the weekend with his family and attend the celebration of a baptism. The fire started on the fifth floor of a building shortly after 8.00 pm on Sunday. It spread very quickly with virulence. The grandmother of 85 years and his caretaker were rescued alive but had to be attended because the inhalation of smoke. The father and the girl were trapped in the back area of ​​the house so they decided to escape through the inner courtyard. Then the girl slipped and fell down before the desperate eyes of his father. Everything points to the flames ripped in the living room floor and it is believed to be caused by a stove or a short circuit (one of the main causes of fires in homes), although the conclusion of the police investigation is still pending. We continue sharing this news because we want to raise awareness and to administrations on the importance of fire protection. The use of fire detectors have alerted firefighters early enough so that we would not have to regret any life. And now, winter is coming so we must consider certain measures to be taken against some heating methods.